10. Respect. Kids, parents, and coaches need to be reminded to respect the game, the players, the coaches, AND their opponents. Coaches play a critical role here, and they teach this by their own actions and the expectations they set for their teams. With competitive play, what often gets lost is respect for the opposing players and as a result, for the game itself. For example, when a player on the opposing team gets injured during play, too many coaches use the time that the injured player is down as an opportunity to strategize with their own teams. This shows an absolute lack of respect for the injured player and the game. It teaches kids that it is more important to get the next play right than it is to show respect for their opponents. Coaches should have their players “take a knee” and wait for the injured player to recover: a sign of respect for their opponents and the game that they all play and love. This idea of respect actually addresses many of the other suggestions that we received. 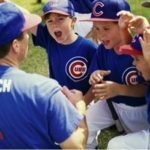 We frequently hear about the bad side of youth sports which is unfortunate because of all of the wonderful experiences and moments that are being overshadowed. An increased focus on respect for the game, for the coaches, players, and officials, could go a long way. What do you think it means to respect the game? How do you communicate this to your kids or players?